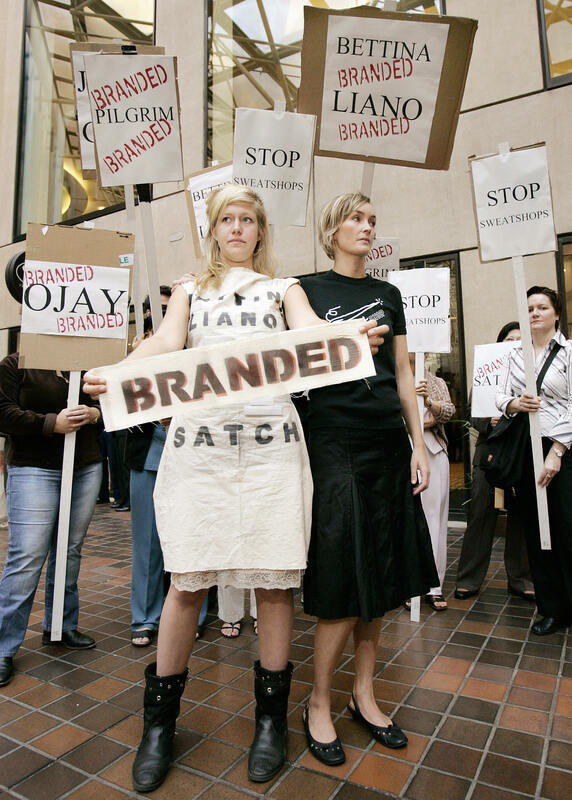 The lines between fair trade and ethical fashion are too often blurred, combined, and crossed. The truth is, there is a difference between ethical and fair trade fashion — and that difference matters when you're trying to make the smartest shopping decisions possible. Of course, buying clothes that are labeled either way is a big step forward towards being a conscientious consumer, but we can always educate ourselves even more. Rachel Kibbe, founder of Helpsy, created 13 guidelines for her ethical fashion site after realizing "there is no standard. Ethical fashion is just something I think the community has using because it’s tried to make the industry better in its production process. There is not a standard definition or production process." Kibbe to me tells she recognizes many people have different definitions of ethical fashion, which is why she wanted to specify the kinds of products sold on her site. Likewise, Kibbe says that fair trade is part of ethical fashion. Maxine Bédat co-founder of Zady, tells me that fair trade fashion is now competing with other terms, such as fair wages, organic, and ethical clothing. To make the difference between the two terms easier, let's break it down a little bit more. The lines are definitely still a bit blurred, but here's a brief primer on what defines each term. Fair Trade: According to Fair Trade USA, products that get to bear the "Fair Trade" logo "come from farmers and workers who are justly compensated." Ethical: The Ethical Fashion Forum says that "Ethical fashion represents an approach to the design, sourcing and manufacture of clothing which maximises benefits to people and communities while minimizing impact on the environment." In short, fair trade focuses on the treatment of the people producing your clothing, while ethical companies strive to reduce our negative impact on the environment and native cultures where your clothing comes from. Fair Trade: In order for an article of clothing or a store to properly brand themselves as fair trade, they must be fair trade certified by Fair Trade USA. They follow guidelines and standards provided by Fair Trade International. According to Bedate, the guidelines do change from country to country. Ethical: The Ethical Trading Initiative is an alliance of non-governmental companies and organizations that "exists to promote and improve the implementation of corporate codes of practice which cover supply chain working conditions." This lack of exact guidelines is why Kibbe made her 13 standards on Helpsy, so consumers know exactly what they're getting. Fair Trade: It's down to the fiber. According to Fair Trade USA, "garment factories must meet minimum workplace requirements based on the core conventions of the International Labor Organization to comply with Fair Trade standards." Ethical: The Ethical Fashion Forum states that the entire production must make the best attempt to provide the maximum benefit to people producing the products, while minimizing impact on the environment. Fair Trade: "Fair trade is paying employees a wage, allowing them a safe place to work and see their children, having time to see family, having a working bathroom. Workers are separated from their amily and live at the factory. There are set requirements whereas ethical are not," says Bédat "Worker payment depends on country, but it should be minimum wage. That goes back to people being able to see their families and pay for education." Fair Trade USA offers an Intro Packet for Factories, which includes guidelines for wage assessment and fair trade training, traceability of fair trade cotton, and many resources. Ethical: According to the Ethical Fashion Forum, "Factories Information about the ethical policies of factories in supply chains, in accordance with the ETI (Ethical Trading Initiative) base code," The ETI regulates place must provide a "safe and hygienic working environment...workers shall receive regular and recorded health and safety training...access to clean toilet facilities and to potable water, and, if appropriate, sanitary facilities for food storage...no new recruitment of child labor...ages and benefits paid for a standard working week meet, at a minimum, national legal standards or industry benchmark standards, whichever is higher." Unfortunately, we still have a long way to go before the entire fashion industry switches over to fair trade and ethical production, but there certainly enough guidelines in place for consumers who want to shop ethically now to do so.